Blythe is the perfect doll to knit for, she is so versatile and everything looks good on her. 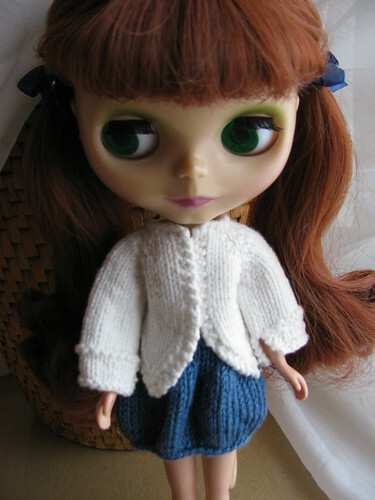 This is one of the first items I knitted for my Blythe named Ginny, a Bulb Skirt. It is a quick and simple knit. A perfect beginner magic loop pattern! Skirt is knitted bottom up. Add ribbing to the waist in the 3 rows before the bind off if yarn does not have elastic. This is a perfect beginner Magic Loop project. Just divide stitches evenly on the needles. *K1, KFB,* repeat to the end. Knit multiple rounds until desired length. This example has about 18 rounds. *K2tog, K1,* repeat to the end. BO loosely and weave in ends. The Blythe clothes are so cute! Thanks! They are fun to knit. My name is Natalie and I live in a southern state. This blog is mostly for knitting and other hobbies. To see a full details about my Blythe dolls see www.pandorasdolls.blogspot.com. I collect all three sizes of Blythe- Neo, Middie, and Petite. They all are charming in their own way. I design knit-wear for all three sizes as well. Besides crafting and collecting dolls, I work in a library as an university archives assistant. I have a bachelors in fine arts and a masters in library science. My 3rd Blythe is in Route!